The Holy Family of Jesus, Mary, and Joseph – Feast - My Catholic Life! Language is like currency. There must be a common understanding of its value for it to function as an effective means of exchange. When that common agreement deteriorates, wages, prices, and costs cut anchor, and economies drift. Similarly, a word can drop in value, suffer inflation, or entirely lose its meaning when a language group loses a common understanding of its meaning. This has happened to the word “family.” Some have inflated the value of “family” to mean any grouping of two or more people, or even one person and a dog. For others, “family” has lost value since their personal experiences of family life were dysfunctional and damaged their mental and emotional development. On today’s Feast of the Holy Family, the Church defends normalcy. She holds up what has always been. She offers her faithful the model of what family life should be. Reflections on the Holy Family presuppose a lack of ambiguity on what the word family means. Common cultural understandings of marriage and family allow more room for more mature spiritual and theological reflection. But if a certain percentage of a culture matures without, for example, experiencing the love, discipline, and guidance of a good father, then it is difficult to talk about the goodness, mercy, and justice of God the Father. Those who didn’t have a father, or whose father was largely absent, will struggle to connect with God the Father being at the same time a judge, a source of mercy, and a font of unconditional love. The same applies to family life. Without an intact family as a model, even one with all of its tensions and imperfections, there is an erosion of what “family” means. 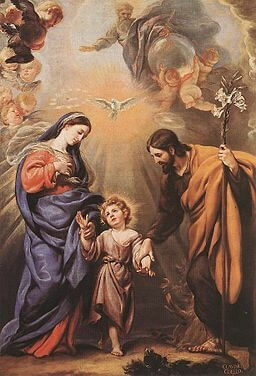 Holy Family of Nazareth, be a model of tranquility and harmony for all families. Give powerful graces to husbands and wives, children and siblings, to overcome differences so they can build a common life with your own as a model.